As in the book of Mosiah, there are two significant flashbacks in the first part of the book of Alma. They highlight successful episodes in the missionary work of the sons of Mosiah among the Lamanites. The text in Alma 1–16 covers events in the land of Zarahemla through the fourteenth year of the reign of the judges. In Alma 17 the narrative reverts back to the first year of the judges and then covers events in the lands of Ishmael and Nephi those same fourteen years (see Alma 17:4). The first flashback recounts Ammon's ministry to the people of Lamoni (see Alma 17–20), and the second records how Lamoni's father and his household were converted through the preaching of Aaron, resulting in the conversion of thousands throughout the land (see Alma 21–23). Approximate dates are listed both by standard configuration (B.C.) and Nephite time (reign of the judges, or R.J.). These flashbacks are yet another evidence of the complexity of the Book of Mormon. It is quite remarkable how these historical accounts fit so neatly together, all coming together again with the Lamanite attacks in the eleventh (16:2 = 25:2) and fourteenth (16:12 = 28:2) years. 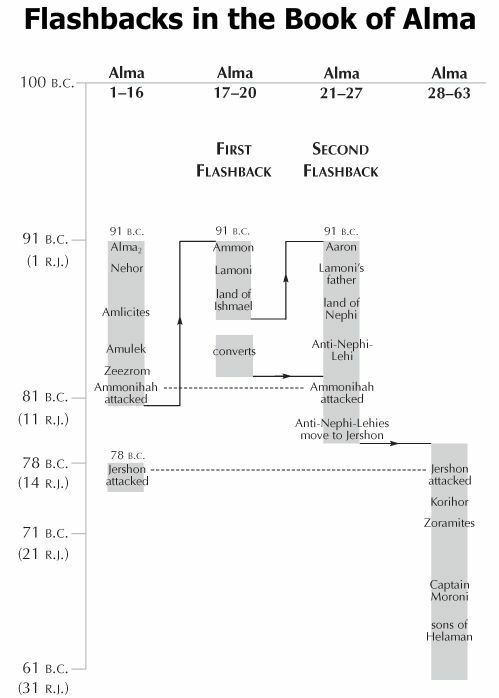 In addition, another flashback (not shown on this chart) is found in Alma 56:1 and 56:9, which returns from the thirteenth year to the twenty-sixth to pick up the story of Helaman's stripling warriors.